One of my complaints with the default Mac OS X Terminal app is that you can’t split the Terminal screen, instead you have to open two windows. Well, this must have annoyed some other developers too because iTerm2 aims to address this problem. iTerm2 is a fork of the original iTerm project for Mac OS X that has some cool features that the default Mac Terminal doesn’t, but the ability to split Terminal windows both horizontally or vertically is the main reason I use the app. Splitting the iTerm2 Terminal windows is really easy, once you’re in the app just hit Command+D to split the window vertically, or Command+Shift+D to split the window horizontally. You can also combine the two to get tiled terminal windows, and then enter full-screen mode to get the full command line experience. I still use the Mac OS X GUI for a bunch of tasks so I just maximized my split Terminals as you can see in the screenshot above, then I adjusted the preferences so that the terminal focus follows my mouse rather a mouse click. iTerm2 is currently in alpha, but it works well and development is actively aiming to achieve “the best command line experience under Mac OS X.” There are a few odd display related bugs when you split screens horizontally and have a transparent background enabled, but usually just clearing the terminal works the display kinks out. It’s also worth mentioning that the iTerm2 app is currently named iTerm, so if you have the older iTerm installed on your Mac you may want to rename this one before tossing it in your Applications directory. If you spend a fair amount of time in Mac OS X command line, I’d recommend checking out iTerm2. Be sure to grab the latest svn build if you want split pane support. You can download iTerm2 for free from Google Code or poke around in it’s source if you’re into that sort of thing. I download iTerm2 build 0.20.20101130 and can’t find any command to split the window and Command-D and Command-Shift-D don’t work. Nevermind. I had an earlier version. The Google Code web page you reference only displays a download link for the alpha14 (Nov 30) version. Go to the Downloads tab and get build 406 (Dec 21). Alpha 15 was just released a few minutes ago and is the first official alpha release to include this feature (the build 406 that Tomball referred to was a “sneak preview” and has some bugs). cool .. look forward to trying this out .. thank you! 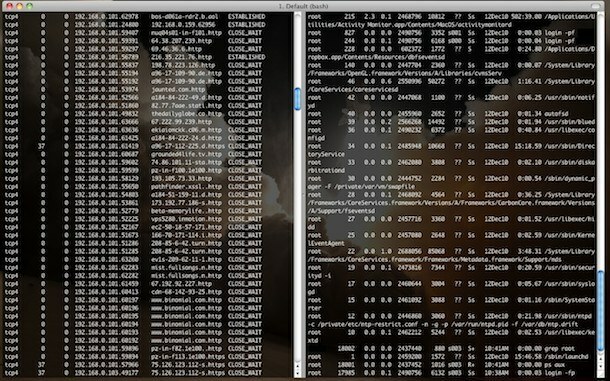 Can’t you split the window in Snow Leopard’s Terminal.app? Also, what’s wrong with running screen? Ctrl-a S to split the screen session and then Ctrl-a c to create a new shell. FYI, Apple+D gives you the ability to split windows in native Mac OS X Terminal App. I tried Apple+D but it just creates two mirrored terminals within a single window, if I type in one it appears in the other and the output appears in both too just like a mirrored monitor… I can’t find any way to turn it off and I don’t see why that would be useful? I’ll use iTerm2 for now, I like split screens. What is up with the guerilla naming tactics to replace my normal iTerm app. I extract the zip and its also named “iTerm”. iTerm2 is from the same source as iTerm, so they just haven’t changed it. If you look at the to-do list on Google Projects renaming the application is on there. But yes I agree it is annoying. There’s nothing lighter, feature-rich, and more useful than good ‘ole Terminal.app with screen! Those other so-called Terminal.app replacements are far from ready for prime time. Don’t waste your time. I’m new to Mac and I’m trying to install iterm2. How do I install the app once I extracted the zip file? I have tried to double click the app and it does nothing. I’m running 10.6.8 MBP.